I wrote “Tsubame-Gaeshi”. It’s the name of the sword Technique. Tsubame-Gaeshi is the sword technique provided by quick change in the opposite direction. A great swordsman of the early Edo period, famous for its technical expertise in the Kojirou Sasaki. Also, as well as fencing is famous as the techniques of Judo and Mahjong. Who is your favorite person in Kengou? I’m waiting for a request. 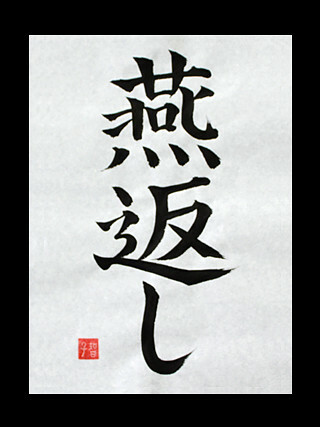 Previous Post Konton – Japanese Kanji for Chaos.